Anyone who has read this blog knows that I’m a sucker for analogies. I find it easier to think better and more creative thoughts if I think outside the box… or if I decide the box actually does not exist to start with. This habit lead to a train of thought, which led to a frantic Google search, which led to this post! With that in mind – why would transmedia be like a green house? Eh? And even if that’s the case, what good does it do us? Below I’ll do my best to show why I think transmedia and green houses have more in common that you’d think. But first, as to “what good does this do us?”… well, anything that can get a creative mind to see projects and obstacles in a new light is a much needed thing and should be included and supported as much as possible. In this case, keeping this picture of a green house in my mind, while battling the many obstacles a transmedia – or even just media – project entails is something I feel could help me to figure out new ways to tackle issues and challenges. Perhaps the same goes for someone else? Now, a green house has a purpose. It is a structure built to house things that should be nurtured and grow. These are delicate things, that if left exposed for too long would probably wither and die. But in the setting of a green house, these things can be cared for, nurtured and supported, until they’ve become what they were intended to become all along. A green house owner has a lot of different options. 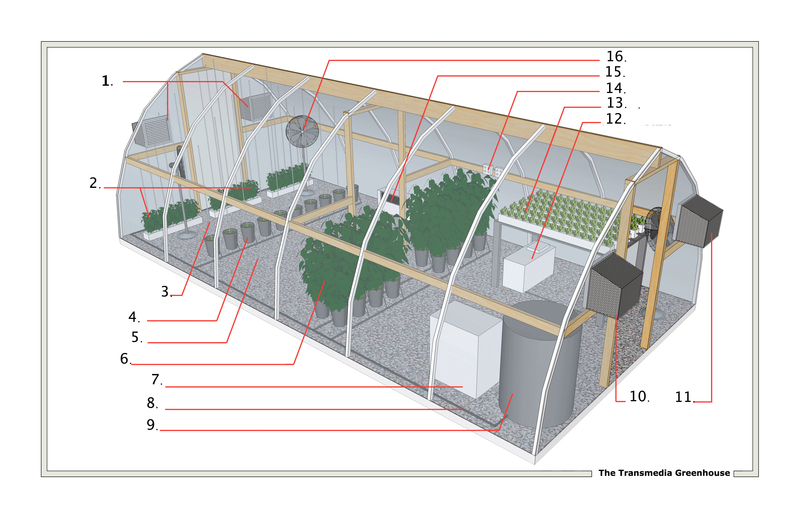 What are the things that should grow in the green house? What kind of green house would the owner go for in the first place? Is this a green house where the general public can apply to be let in, given tools and space and start growing something themselves? When it’s time to harvest, does the owner sell all his or her crops to a major distributor, or is it a case of servicing the general public by, for a fee, allowing them in to harvest a set amount of crops themselves? In my mind, the green house is the transmedia project, and more specifically the story world that everything bases itself in. It’s the structure that gives the ramifications, it’s the roof and the walls that protects the other different elements from harsh conditions and even harsher weather. And it’s a lot of other things. Here’s the Transmedia Green House! 1. + 10. + 11. = “Ventilation units”. Crucial parts that prevent stagnation. They let in new ideas, new funding possibilities, new practices, new partners etc. 2. “Tomato plants”. Essentially the third story element of a transmedia project. Can be an ARG, can be webisodes; whatever makes sense and fits the best. 3. “Ropes to support vertical growth”. A typical example of the need to provide the right tools and the right expertise to different parts of the transmedia project. Not everyone need ropes, but the ones that do will grow all the better with them. 4. “Cucumber plants”. This could represent the second story arch of a transmedia project. Perhaps a book? 5. “Gravel flooring”. This is the basis of the story world. It must be even, so things don’t fall over. It must be well packed, so things don’t sink into it. And it must be able to support more people and projects than originally intended, if it turns out to be more successful than anticipated. 6. “Pepper plants”. The first story arch within the story world. Perhaps a TV series or a movie? 7. “Evaporative Cooler”. For documentation, for story bibles, for consistency and most of all for keeping people sane when trying to keep track of all the different parts of the project. Chill! 8. “Irrigation hose”. Or as I like to call it – the “never-go-dark-hose”. Keep it flowing at all times to make sure all the different parts of the story world stay irrigated and thriving and growing and interesting. 9. “Nutrient reservoir“. The closed off holder for unused ideas. When developing, make habit of documenting EVERYTHING, and what you don’t use, put it in the reservoir. For future brain storming sessions etc. 12. “Nutrient reservoir”. This one is different. It’s the place where you store the tools for people visiting, tools that they can use to help grow stuff themselves. 13. “Lettuce”. The playground for the audience, or the “sandbox” or whatever term you feel like using. This is the place where the audience can get their hands dirty and create within the boundaries of the story world. 14. “Outlets”. Don’t be afraid of new technologies. Stay abreast of innovations, also in the technical areas, and be prepared to include tech that makes sense in the context of your project. 15. “Propane heater”. Make sure you have contingency plans in place; if the story world or the stories don’t take off as intended, turn on the heater. Approach niche interest groups. Hold sweepstakes. Try to grow something else, if one or more of the crops refuse to grow. 16. “Oscillating fan”. Make sure your story world never goes stale. Innovate, churn around, find new influences and new paths. Simon Staffans is a content and format developer and media strategist, employed by MediaCity Finland. He works with multiplatform storytelling, transmedia development procedures and great stories. Contact him at simon.staffans(at)gmail.com or follow him on @simon.staffans. Heh, no, these things pop up in a totally non-intoxicated mind 🙂 . just got back to you btw!